The Incirlik Air Base in southeast Turkey — from which US pilots launch bombing raids on Daesh forces in Syria — is home to about 50 B-61 nuclear bombs. That makes it NATO’s largest nuclear storage facility. Each bomb has a yield of up to 170 kilotonnes, nearly a dozen times more powerful than the weapon that destroyed Hiroshima. 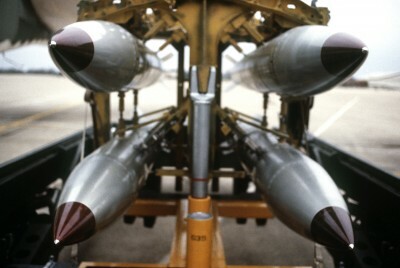 The bombs are stored in underground vaults within aircraft shelters that in turn are protected by a security perimeter. Last week, Incirlik was in the headlines because it appears it was one of the command centres of the attempted coup that sought to topple President Recep Tayyip Erdogan. After the coup had been thwarted, the commander of Incirlik was arrested and charged with complicity in the overthrow attempt. “The security of the bombs is premised on them being defended by loyal NATO forces. In the case of Incirlik that loyalty proved uncertain at best. Power to the base was cut after mutinous troops used a tanker plane from the base to refuel F-16s that menaced Ankara and Istanbul”. Most tellingly, former NATO Supreme Allied Commander James Stavridis recently wrote that if NATO really does house tactical nuclear weapons at Incirlik Air Base, “this poses a very dangerous problem”. In April 2009, US President Barack Obama, in front of an adoring crowd in Prague, spoke of his plans and dreams for a nuclear-free world. Years later, he does not have that much to show for it. When Dimitri Medvedev was Russia’s president, they did fashion an agreement that cut their armouries of intercontinental missiles by a substantial amount. Even so, Obama — in order to win the support necessary for ratification by Republicans in the Senate — he had to agree to a long-term $1 trillion modernisation of America’s nuclear armoury. Obama has made no progress on curtailing short-range “tactical” missiles based in Europe and Turkey. He has produced no rationale for keeping them or indeed those bombs stored at Incirlik. Nevertheless, as his presidency winds to a close, Obama is preparing to challenge the Republican congressional leaders and the heads of Senate foreign relations and armed services committees. He is garnering wide support for his reported plan to implement at least a part of his Prague nuclear agenda through a series of executive orders. US presidents have the right to make laws on their own say so. However, unlike a law legislated by Congress, a successor can simply nullify them. The Washington Post reported this month that the executive options Obama is considering include declaring a “no first use” policy for the United States nuclear arsenal and a UN Security Council resolution affirming a ban on the testing of nuclear weapons as envisaged by the Comprehensive Test Ban Treaty, which was conceived in the time of president John F. Kennedy but which Congress has long refused to ratify. Obama is also considering offering Russia a five-year extension of the START treaty’s limits on deployed nuclear weapons, a delay in the development of a new nuclear cruise missile, called the Long-Range Stand-Off weapon, and cutting back long-term plans for modernising the nation’s nuclear arsenal, which the Congressional Budget Office reports will cost about $350 billion over the next decade. Certainly if this were done — along with the closure of the Incirlik nuclear armoury — Russian public opinion might start to take Obama seriously again. Even at this late stage President Vladimir Putin could be persuaded to take some initiatives of his own. This “ban the bomb” president should not leave office without having done what he said he would.